The frames are also bursting with flowers and the later forms and hybrids of Narcissus cyclamineus are still flowering well. The larger pale one at the front right is the true Narcissus 'Queen of Spain' while the other ones around it were all once, and still sometimes are, mistakenly called by that name. Several of the frits that enjoy cooler moister growing conditions also grow in this frame like the dark F. burnatii. Fritillaria burnatii is related to and often given as a subspecies of F. meleagris. On the right is the plant that I grow as F. burnatii and like many plants I am continually trying to verify the correct name and there is some confusion surrounding burnatii but I am 90% certain that this is correctly named. On the left is a form of F. tubiformis that falls somewhere between the typical dark form and the yellow subspecies moggridgei. We got the original bulbs from Harold Esslemont many years ago but unfortunately they were virused. I grew them in isolation for a year until I got seed from them and all the plants I now have are from that original seed or subsequent generations - they all they all exhibit the same colour variation. 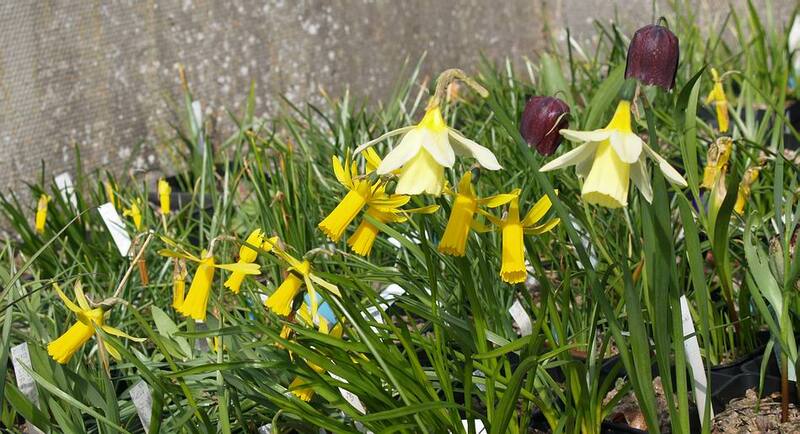 In the bulb house it is Narcissus bulbocodium obesus that is flowering and here are two lots of seedlings showing the range that even a subspecies will produce. Both these plants conform to obesus - one flowers on very short stems while the other flowers at around 8 to 12 cms high. Last week I showed pictures of me hybridising using N. triandrus as a seed parent - here is one I did not make earlier. 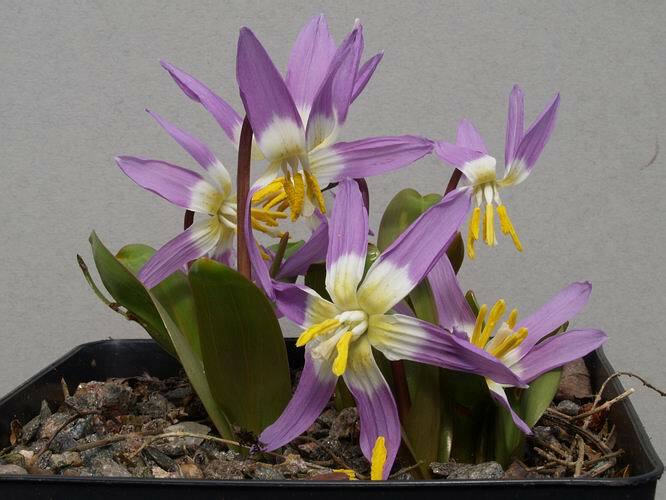 This appeared in one of my pots of N. triandrus seedlings from my own seed which I tried to keep as true triandrus. Obviously the plant had other ideas and a bee must have brought some pollen in from a trumpet daffodil of some kind. The only trumpet type I can remember growing in the same bulb house that year was N. 'Queen of Spain' so that may be a contender. I am not sure that I like it but I will plant it out in the garden and see how it does. 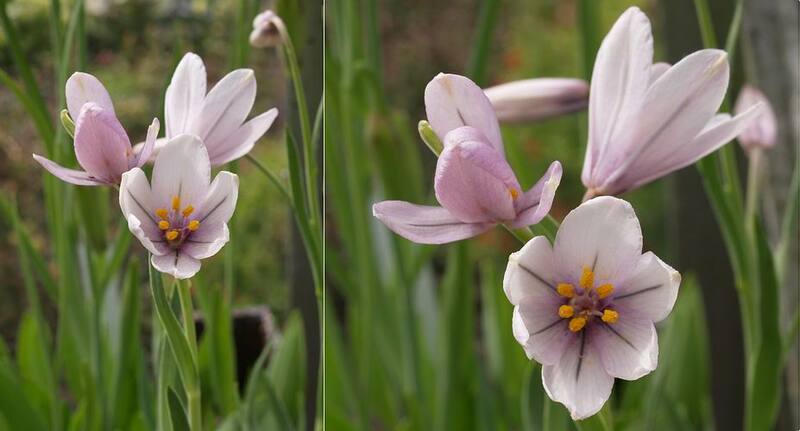 A few more tulips from my growing collection are in flower Tulipa clusiana and saxatalis. While not difficult to grow they are not easy plants to keep compact and looking good for the show benches but scrambling up through the jungle of leaves in the bulb house they look great to me. 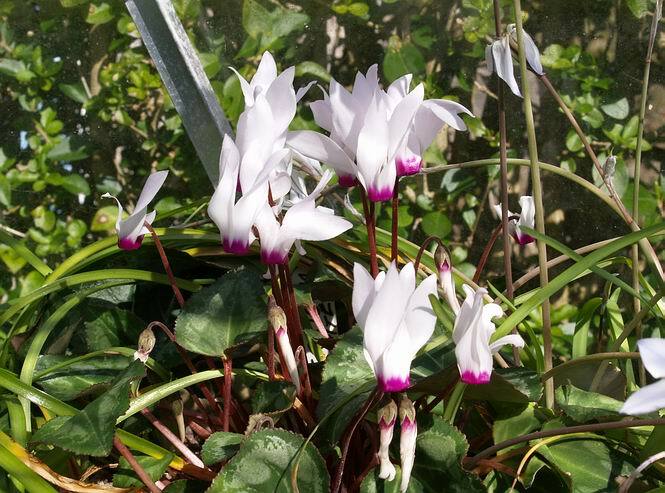 Also fighting through the jungle is the beautifully scented Cyclamen persicum which flowers beautifully every year for us. Despite the poor growing season last year when many of the bulbs had their growth cut short by unseasonable soaring temperatures, a good number of frits are flowering albeit with fewer flowers per pot than I would like. 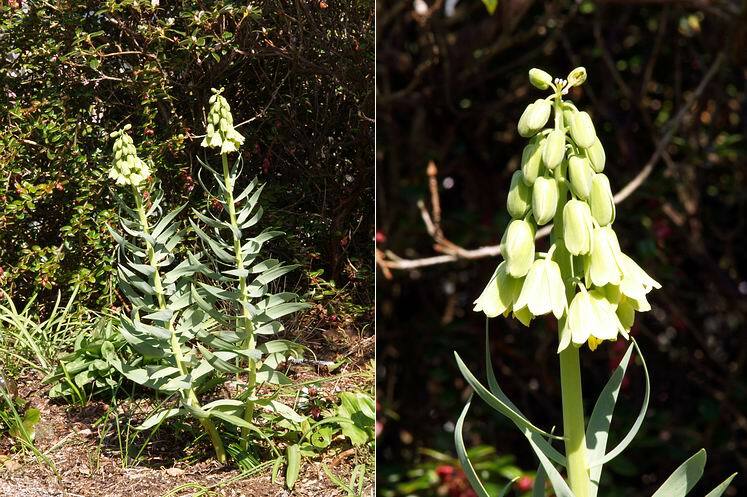 Pictured above are two forms of the very variable Fritillaria crassifolia both of these flower on very short stems of 3 to 6 cms. The range of colour variation in the tepals is extraordinary but the trifid style and linear nectaries are always present to help us identify this species. 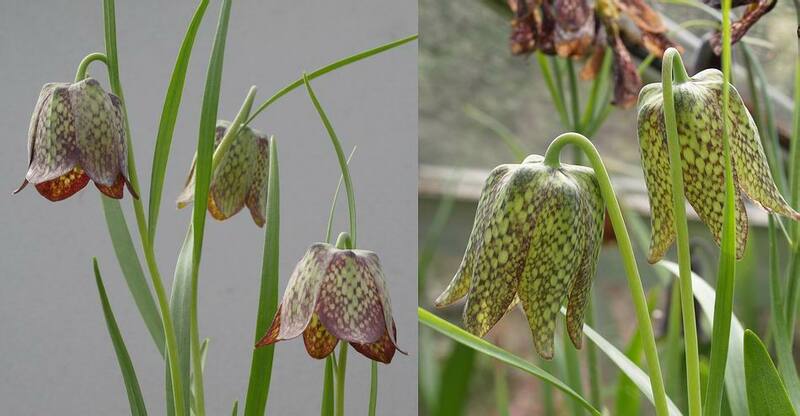 One of my very favourites is Fritillaria whitallii which also exhibits a considerable degree of variation but it always displays this green with brown checkering pattern to some degree. 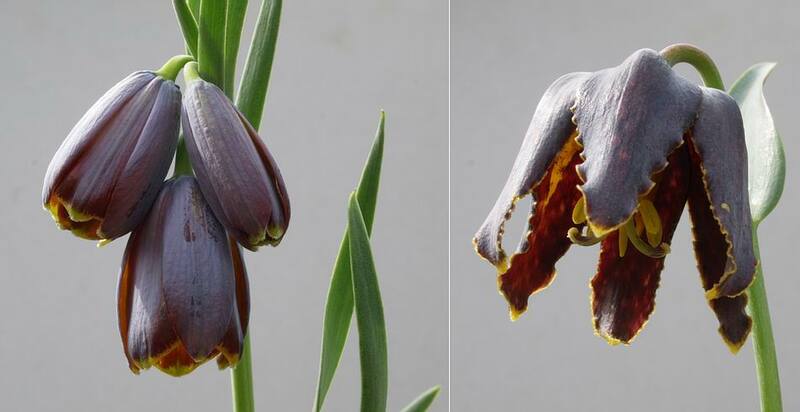 A less common bulb is Fritillaria sororum, it is one of the more recently named plants that looks superficially like F acmopetala. 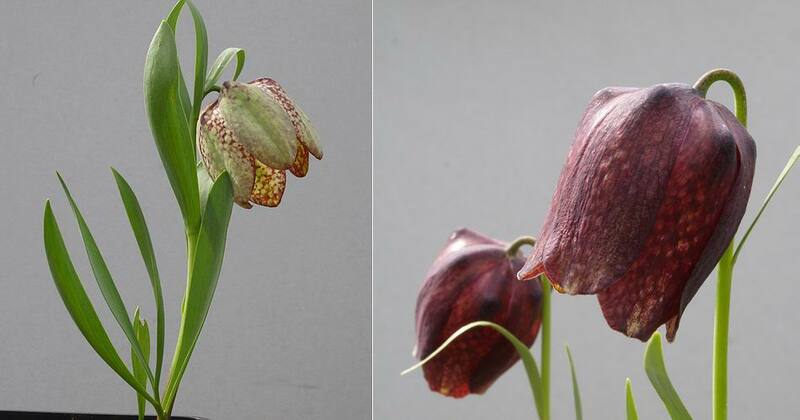 Two frits that share a similar colour but have very different looks and origins are Fritillaria stribrynii, on the left, which grows in Bulgaria and Turkey and the reptilian F. lancelota tristulis from Western North America. 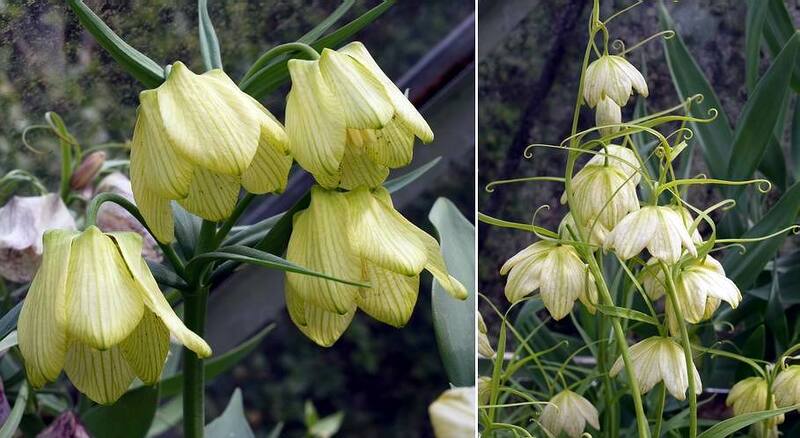 Not in such full flower as normal due to having its growing season cut short last spring but still making an acceptable effort is the very beautiful Fritillaria pluriflora -it is much more like a dwarf Lily than a frit. This is also one of the Western North American species. 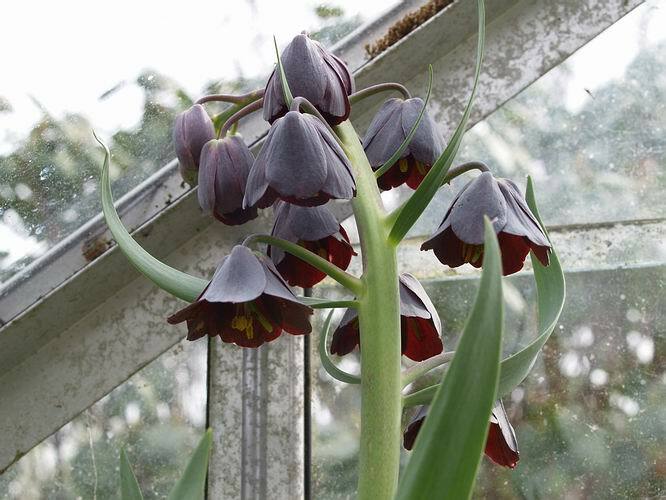 In a corner of the frit house is a tangle of Chinese frits and getting tangled is what they have evolved to do with the cirrhose tendril like tips to the leaves designed to grab hold of any support and help prop up the flower stems. 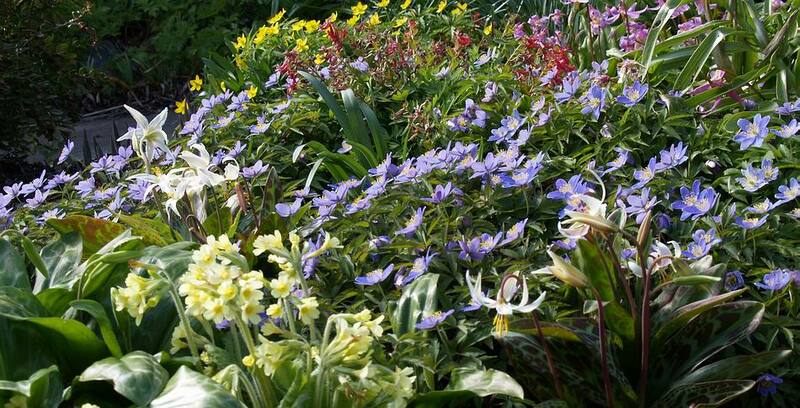 From back left to right is Fritillaria tortifolia, pallidiflora and thunbergii. I grow both of these frits in the garden as well where they look best but I have always kept some seedlings or young plants under glass just in case I lose the ones in the garden. In all the years I have been doing this it is the ones in the garden that have done best - there is a good lesson there. 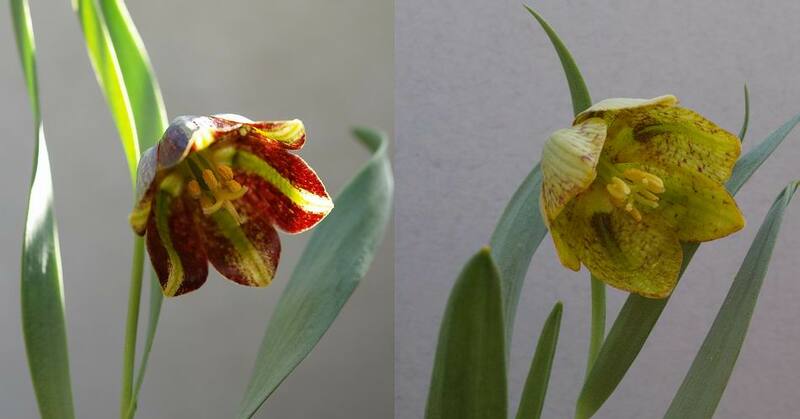 Fritillaria pallidiflora on the left has beautiful pale yellow flowers - just tip them back and look inside and you will be greeted by a lovely display of red spots in the throat. F. thunbergii has been grown in the UK for a very long time but it has spent most of that time wrongly named as F. verticillata and it is still sometimes seen under that mis-name. Also in the tall jungle corner of the frit house is the tall Fritillaria persica which reaches up to the roof. To be sure of getting it to flower I need to keep it under glass where it can reach the warm temperatures it requires in late spring to form next years flower buds. 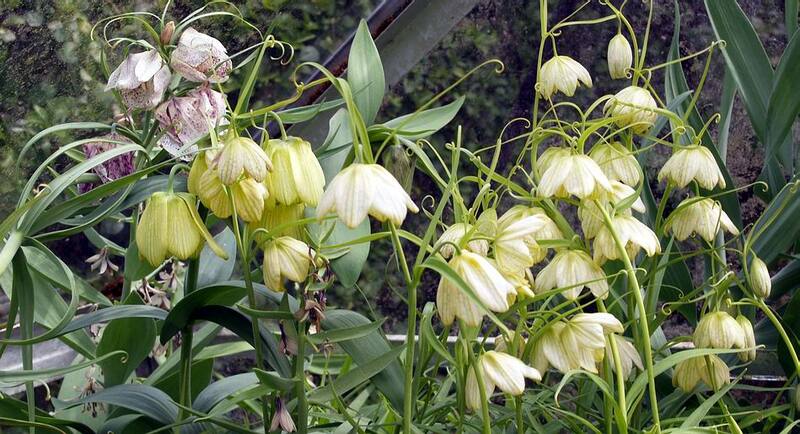 Last year I bought some Fritillaria persica alba bulbs and I planted one in the garden and kept one in a pot. The one in the pot has not flowered - the stem has immature aborted flowers on it while the garden bulb has two beautiful flowering stems. Now was it how I have been growing the potted one over winter that caused it to fail or did I choose the biggest bulb to plant out? It will be interesting to see if the outside one will flower again next year - I do hope so. There are Erythroniums coming into flower every where - more of that next week- but here are some flowers of the beautiful cold loving Erythronium sibericum. This form was collected in the Altai mountains and, as I described last week, I have to move it under glass to get the stems to grow - the flowers are very beautiful with their tricolour scheme. This year sees the first flowering of some of the seedlings that I raised from seed sent by my friend Finn Haugli in Tromso where this species grows so well and I am delighted to see that they flower on a good sized stem with out any manipulation by me. I have a number of pots of these and look forward to planting most of them out into the garden later this year when they go dormant. A close look at the flowers - the two on the left are Finn's seedlings and the one on the right is from the Altai. 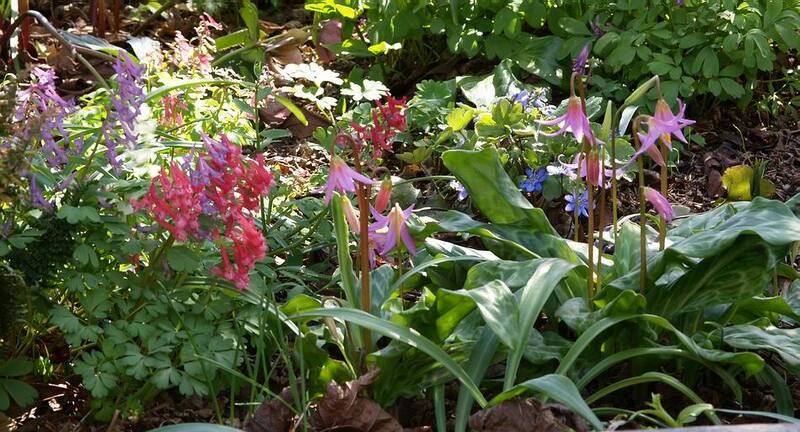 Even in deep shade I can find spring bulbs that will perform and add colour to the garden.